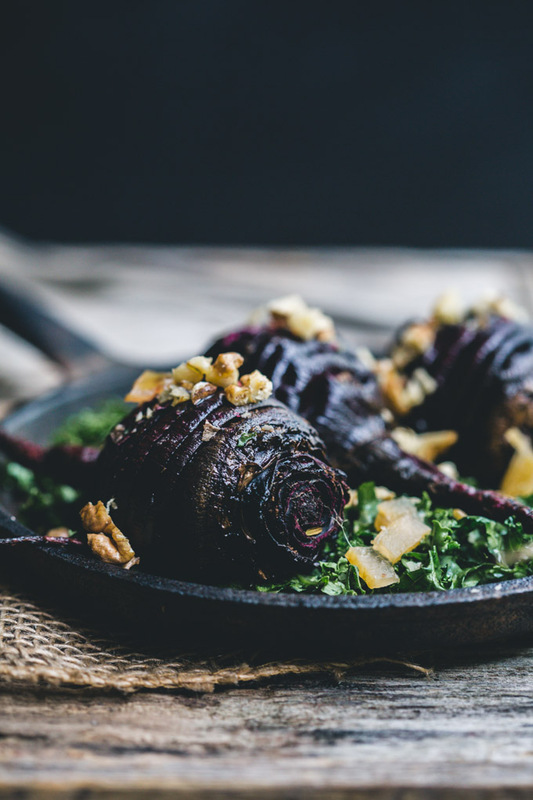 Hasselback Roasted Beets with thyme, on their own or served with a horseradish cream, preserved lemons and toasted walnuts, this recipe celebrates the humble beet and makes it just a little bit fancy. Three years ago I unwittingly entered a popularity contest. When the Elf emerged, all 7 pounds 6 ounces, I had no idea in thirty short months I would be jockeying for favour. No one told me that parenting a toddler often means feeling like a kid yourself, one that is picked last for sporting teams and never invited to the cool parties. It all sounds a little John Hughs circa The Breakfast Club doesn’t it? And sometimes it is but after several months of not being picked I am becoming used to our new normal. Well “used” might be a stretch, I think I have stopped wincing when the arrows fly. Once upon a time I was the nourisher, the slayer of bad dream monsters and a mobile giggle factory rolled in to one. These days I am the bedroom cleaner-upperer, the maker of Vegemite sandwiches and the person who steps aside so the Elf can cuddle Daddy. There’s an arrow right there. My lifeline in this freaky about-face is the knowledge that I am not alone. Freud picked the Father/Daughter bond whilst at the same time admitting girls were a mystery to him and my excellent Gang of Mothers – those wonderful, amazing warrior women who remind me I am not alone – tell me it’s not me. It’s her. This is a space in time when our children favour time spent with one parent over the other; they favour the time not the person. It is her process, not mine and I have to respect that. In the meantime I have become an excellent vegemite-sandwich maker and I have mastered stepping aside without tripping over my own ego. While I am not Ms Congeniality I know she is in good hands. And can I take comfort in the knowledge that I always win in the kitchen. He doesn’t know a hasselback from a Hasselhoff. I found these gorgeous little beetroot globes – or beets – in our local organics store and had to have them. A little larger than baby beets but smaller than full-grown, they are the perfect size to serve hasselback. With a shape similar to potatoes, beets can be cut beautifully in the hasselback style allowing the seasoning and herbs to really penetrate the vegetable during roasting. These hasselback roasted beets are simply cooked with a single stem of thyme and plenty of sea salt keeping the favour of the beets alive but enhanced. 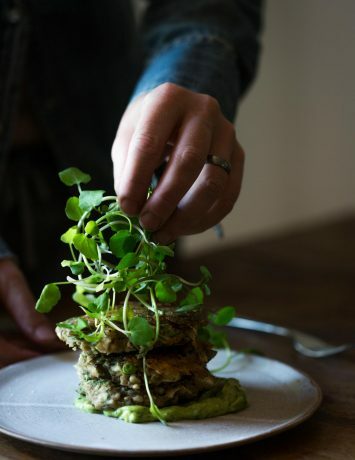 They could easily be served as-is as a side but I love pairing their earthy sweetness with hot horseradish mayonnaise (or cashew cream if you prefer), salty preserved lemon and toasted walnuts. Add a base of sautéed kale or baby spinach and you’ve got yourself a fancy-looking-but-very-easy-to-make salad. I serve this dish at room temperature with the mayonnaise on the side. Horseradish is a polarising flavour, either loved or hated, so serving it on the side bridges the divide. Ginger would work as a substitute if you are unequivocally anti-horseradish. At the end of the day, the hasselback roasted beets are the star here but I do love the layers the other elements provide. All play a unique part in creating a delicious, balanced bite. Enjoy. Hasselback Roasted Beets served with horseradish cream, preserved lemons & toasted walnuts, these beets are effortlessly fancy. sea salt1 cup kale de-veined and finely sliced in to ribbons optional. Prepare the beets by slicing a small section of the underside of each one to provide a flat surface. With a small sharp knife, slice the beet horizontally along the length of the beet in 2mm intervals being careful not to cut al the way through. When finished the beet should have deep scores all on the length of the vegetable. Place the beets, scored side up, in a baking tray and drizzle with olive oil and season well with sea salt. Place a stem of thyme on each beet. Roast in the oven for 45 minutes to 1 hour until cooked through. Meanwhile, to make the horseradish mayonnaise, combine the horseradish and mayonnaise in a small bowl. In a small dry (no oil) pan, toast the walnuts for around 3 minutes until toasted but not burned. Remove the walnuts from the pan and roughly chop. If making a salad, sauté the kale for 1 minute in a dash of olive oil. Once the beets are cooked, remove from the oven. If serving warm as a side, place beets on a plate and sprinkle with a pinch of preserved lemon and a scattering of walnuts. Place a spoon of horseradish mayonnaise on the side or on top. To make the salad, allow the beets to cool to room temperature. Place the sautéed kale on a plate and follow with the roasted beets. Sprinkle with preserved lemon and toasted walnuts and serve with the horseradish mayonnaise on the side. Lightly drizzle a small amount of olive oil and season lightly with sea salt.